Mr Fothergills - an Australian seed retailer - has an 'ad' in this month's Gardening Australia magazine. I put ad in inverted commas as it's quite clearly designed to look like an article, with no branding on the page but plenty of text. The text focuses on two things: that Australians, on average, don't eat enough vegetables; and that part of the reason for that is their high cost. The ad claims '5 daily serves of vegetables for a family of four can average well over $1,000 a year'. 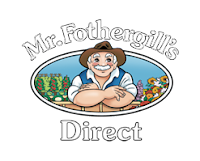 The alternative, of course, is to grow one's own, and to that end the ad contains a table listing half a dozen of Mr Fotherfill's seeds, their estimated yield and the cost per kilo of yield, versus the average supermarket price of the same product. I'm a strong believer in urban sustainability, growing your own, locavorism etc. But I'm surprised to see a company that ostensibly shares the same values presenting such a biased version of cost. First of all, I don't think $1,000 a year, for four people, is too much to pay for vegetables. Secondly, why do vegetables have to be 'cheap'? I think this is a great misnomer of our time, the cost of fresh produce. People are rejoicing that bananas are back down to $2 a kilo. Remember when they were more than $15? It was terrible! Well, it was frustrating that a couple of bananas cost several dollars, but a cyclone had wiped out an enormous portion of supply. Lower supply + same demand = high prices. It's really simple market economics. And, frankly, I think $2 a kilo is an absurdly low price for a weighty product that doesn't grow within a thousand or more kilometres of Melbourne. As Alla Wolf-Tasker - chef extraordinaire at the Lake House - says, 'There is no such thing as cheap food'. A part of the marketing strategy for many supermarkets is advertising products that cost less than they did a year ago. I've always found that a bit strange, and the message I get from it is that we can't take their word on what a product 'costs'. Fresh produce should not sit at a fixed price. We should not expect to always be able to get apples for $6 a kilo or tomatoes for $4. We recognise that with the products that are still acknowledged as seasonal - mangoes, grapes, berries etc. But it goes for all of them. Mr Fothergills does have a point though. Even though they ignore the cost of potting mix, plant food etc in their pricing of produce grown from their seed, at least a vegetable grown in your backyard demonstrates a truism more certain than market economics - you get out what you put in. Let's wind back a step here. They are advertising low-calorie water. Water. The stuff that comes out of the tap, made up of hydrogen and oxygen, rather than a bunch of carbohydrates that want to make friends with your hips. I've been pretty flabbergasted over the last few years as these super-waters started, ahem, flooding the market. Bottled water is bad enough, with each 600ml bottle requiring about twice that much water to manufacture and distribute. Even advertisers tip their cap to the industry that has made so much money out of the ultimate free commodity. But any product, no matter how successful, needs innovation to keep up the buying trend, so the gurus at Coca-Cola (Glaceau, who puts out VitaminWater, is a subsidiary of the soft drink giant) put their heads down and came up with stuff to put in the water to make it better for us. Advertising for VitaminWater is admirable - it's Gen Y styley with plenty of social media presence, and products spruiked to help in situations from hangovers ('get perky when you're feeling murky') to workouts ('more muscles than Brussels'). There's even VitaminWater 'uncapped' which sets out, armed with 600ml bottles of pick-me-up, to uncover the latest in music, sports and fashion. 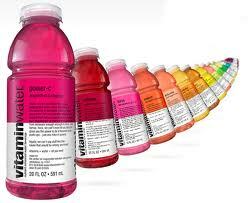 The original VitaminWater10 range, with products names such as Focus, Revive and Spark, is pitched as a 'nutrient enhanced water beverage'. The liquid of life is improved with an alphabet of vitamins and flavours described as both fruit and 'other natural'. They push the healthy line pretty hard: in the products area of the VitaminWater site, the interactive feature allows users to 'rollover to view nutrition info', which merely enlarges the front label of the bottle - already clearly visible - to zoom on the list of vitamins and additives such as taurine and chromium. It's a simple nutrition panel - it must be good for you! So where, in amongst the -ins, -ines and -iums are the -oses? Where does sugar come into this? It seems pretty extraordinary that enough sweetener had been added all along to make it worth their while to bring out a whole new range that in effect spruiks the unhealthiness of the original product. And it shits me that the conglomerates have carte blanche to take over the 'healthy' soapbox with 'enhanced water' (come on, it's a ridiculous phrase) when in fact that enhancement is in no small part sugar, the ingredient against which genuine health experts are fighting an uphill battle. Fructose free III - at what cost? I give great credit to Sacs in Westgarth. Formerly the wonderfully named Silly Yaks, this cafe and foodstore serves a full range of food suitable not only for a coeliac diet, but also for those avoiding fructose. A range of breads, pasta and ready meals are available from the freezer, and the cafe offers pies, pizzas and sweets, all marked out as FF or GF. They even offer tarts with forbidden fructose-laden fruits, wherein the fruit has been cooked with dextrose, which binds with the fructose to carry it across the stomach wall, hence avoiding the deleterious effects of fructose malabsorption. But...and this is a big but...their takeaway products are horrendously expensive. I ducked in this morning to look for some gluten-free breadrolls (pack of 4) so I could partake of burgers at home, as well as pastry to wrap around the mince we bought in readiness for sausage rolls. What would you expect to pay for two such pantry staples? Instead, for that money, I have two meal components, not even two complete meals. Now, grumbling aside (and I confess that as I left the shop I was pretty grumpy), let's consider what this actually means. The food we stock our pantries with, despite protests to the contrary, is, in the main part, quite cheap. A large proportion of the population can't satisfactorily process a lot of wheat, yet white flour is a staple of our diet. It's cheap and easy to grow, harvest and mill, and it has just the right amount of stickiness - or gluten - that we've come to expect in everything from bread to muffins to pastry. And, thanks to monoculture farming, it keeps the costs of those types of products low. So it's pretty scary when you step outside the protected world of mainstream groceries. Firstly, to discover how many alternatives there are - rice, tapioca, soy, barley, oat, buckwheat and maize flour to name some - and what the cost of production and distribution is when you don't have the back-up of a large corporation. You can't just replace wheat flour one for one with another choice - to get a reasonable consistency you need a mix, so there is more involved in product development. And, not everyone likes it, so the market is smaller. However, not everyone likes stomach cramps and headaches after a sandwich either, so people like me who are trying to lessen health problems are faced with elevated costs for alternative items, in part because mainstream costs are kept so low. Think about bananas. When they're $17 a kilo people get angry. But that's what they cost when supply is low. When they're $4 a kilo, noone's thinking about the fact that they're still travelling thousands of kilometres to fill the market in cooler climates. The cost of food isn't a static one, yet supermarkets push prices down on lead items as if they can control the weather. If stores stocked a range of bread products, the white flour options might cost a little more, but the alternatives would almost certainly cost a lot less. I'm still thinking of other options for that $30, and while the cost will make the sausage sandwich I've got planned for lunch a little tougher to swallow, I can take some comfort from contributing to the possiblity of alternatives one day actually breaking into the mainstream. And the lack of physical symptoms afterwards will feel pretty good too.